Seekers Estate Agents, a sales and lettings agent based in Erdington, Birmingham, has failed to pay awards totalling £4,137 following two separate complaints relating to a series of failings in their letting and management service. As a result, the agent has been expelled from membership and registration for redress with The Property Ombudsman (TPO) scheme for a minimum of two years. Published on Friday, 22 December 2017. 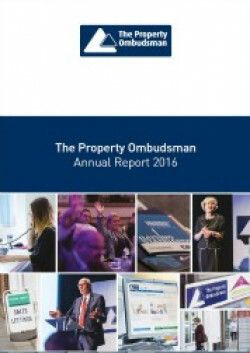 The Property Ombudsman (TPO) scheme has responded to the APPGEBE's call for evidence for its New Homes Ombudsman Inquiry. TPO's response can be viewed here. Published on Wednesday, 20 December 2017. Secure your place at one of the free roadshow events - find out more about the briefing sessions being led by Scottish Government, and a series of talks, workshops and networking sessions TPO and ARLA will be providing in December. Book your place! We’re delighted to confirm that tickets for TPO's 2018 National Conference have gone live and to celebrate, we’ve launched a special Early Bird ticket offer, which is available for a limited time only. Published on Monday, 18 September 2017. Competition and Markets Authority (CMA) has imposed a six-figure fine on five estate agents for secretly agreeing to set minimum commission rates. Today, The Property Ombudsman (TPO) has issued a warning to all estate and letting agents to act with caution, as fraudulent ‘buyers’ target agents with the latest computer virus scam. A sales and lettings agent in South West London has been expelled from The Property Ombudsman (TPO) scheme for a year after the Ombudsman supported a landlord complaint. Three agents have been expelled from membership of The Property Ombudsman (TPO) scheme for two or more years, after failing to pay awards made by the Ombudsman or comply with TPO’s Codes of Practice for Residential Estate Agents and Letting Agents. Shields & Co UK Limited, a letting agent based in Lenton, Nottinghamshire, has been expelled from membership and registration for lettings redress with The Property Ombudsman (TPO) scheme for a minimum of two years, after it failed to pay an award of £3,157.15 following a complaint involving outstanding rental payments. Consumers are being warned that Blackhorse Property Management Limited in Bradford (trading as Blackhorse Property) has been expelled from both sales and lettings redress membership with The Property Ombudsman (TPO) scheme for a minimum of three years, after it failed to formally respond or pay awards made for two separate complaints.